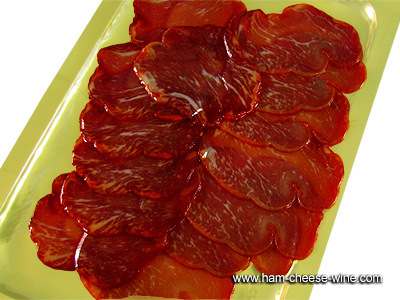 Iberico Pork Loin de Bellota Fermin Sliced is made with high quality ingredients and seasoned with natural spices, olive oil, oregano, garlic, nutmeg, sea salt and paprika which gives it its characteristic deep red color. 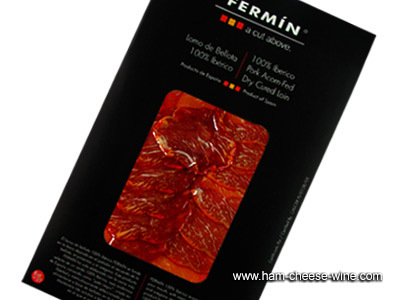 Iberico Pork Loin de Bellota Fermin Sliced will delight your palate with an exquisite aroma and intense flavor. This iberico pork loin de bellota is a high quality sausage claimed even more than the ham itself or shoulder. An inimitable product, of great taste and distinction. Definitely a great choice, vacuum packed for better preservation. 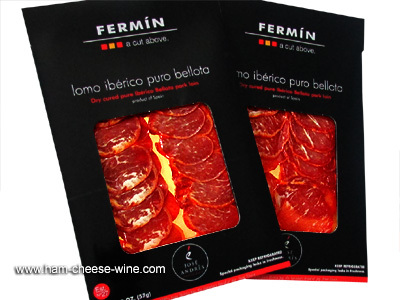 Among iberian cold cuts, Iberico Pork Loin de Bellota Fermin Sliced is known for being a handmade product with a quality able to delight the most demanding gourmet. Furthermore, only those products that bring in the highest degree all the exquisite qualities that characterize these Iberian products of unmatched quality are chosen. Iberico Pork Loin de Bellota Fermin Sliced is cured for three months in an environment of 14-15 ºC, with a relative humidity of 75%. Iberico Pork Loin de Bellota Fermin Sliced, like the rest of cured loins, is to be eaten raw and is one of the finest products of the Iberian pig. 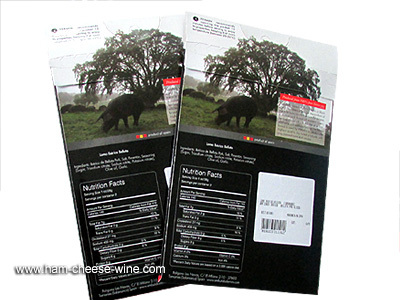 Embutidos y Jamones Fermin company shows the quality of its productions and a style of work that has given it countless awards, like the award for "Best Spanish Food Company"
in 2006 and in 2011 the gold SOFI, the most important gastronomic award of the United States. In 1999 it was the first company approved to sell in Japan, in 2005 it was the first company and the first Spanish slaughterhouse to gain approval to export Iberian ham to America. Currently, from its processing plant in La Alberca, it exports Iberian products to countries on five continents. 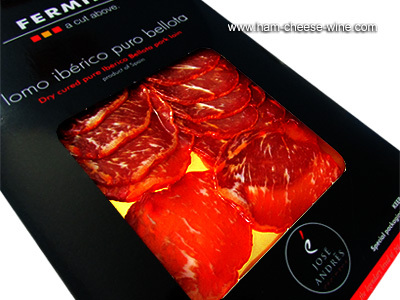 This Spanish product has special features given by the nutritional values of the products it is derived from, in 28 g of this magnificent Iberico Pork Loin de Bellota Fermin Sliced sausage there are calories by 96.6%, 6.6 g total fatty acids, 2.5 g saturated fatty acids, 27.0 mg cholesterol, 395 mg sodium, 0.4 g carbohydrates, 8.9 g protein. 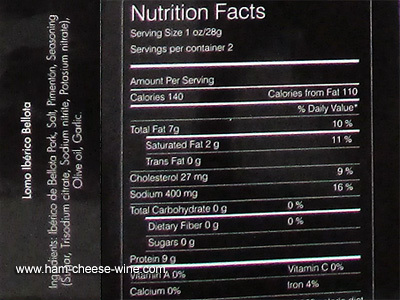 It is a dish to enjoy in breakfast and snacks with a good manchego cheese or any other Spanish cheese soaked in a delicious wine, a perfect match to a pleasant evening with friends and family.